Atlanta Braves Hank Aaron hits career home run 715 against Los Angeles Dodgers pitcher Al Downing on Aril 8, 1974 at Atlanta-Fulton County Stadium in Atlanta, Georgia. 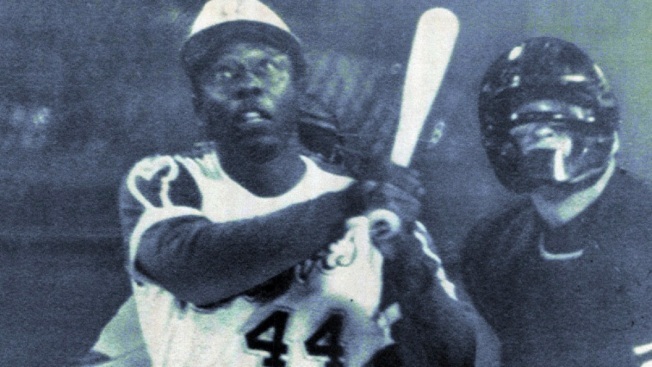 Baseball commissioner Bud Selig called Hank Aaron "ideally suited to become Babe Ruth's heir" on Tuesday night as he participated in the Braves' celebration of the 40th anniversary of Aaron's record-breaking 715th homer. Aaron, 80, was given a standing ovation in the ceremony before the Mets-Braves game. Aaron broke Ruth's record with his homer on April 8, 1974 off the Dodgers' Al Downing. Downing attended the ceremony and threw out the first pitch. Some of Aaron's 1974 teammates returned, including Dusty Baker, who was on-deck when the record-breaking homer was hit, Ralph Garr, Phil Niekro, Ron Reed, Marty Perez and Tom House, who caught the homer in the bullpen. "The game of baseball was a way that I relaxed myself each year that I went on the field for 23 years," Aaron said. "I gave baseball everything that I had, everything, every ounce of my ability to play the game I tried to play to make you the fans appreciate me more. Thank you." Aaron hit 755 homers with the Braves and Brewers. Barry Bonds, whose career was tarnished by steroids allegations, broke Aaron's mark, finishing with 762. There were thinly veiled references to Aaron and Bonds during the ceremony. Braves chairman Terry McGuirk said Aaron "set the home-run record the old-fashioned way" and added "You will always be the home-run king of all time." Retired Braves broadcaster Pete Van Wieren earned a big ovation when he said Aaron is "still recognized as baseball's true home-run king." Selig called Aaron's 715th homer "the most famous and treasured record in American sports." Selig said Aaron was a worthy successor to Ruth as home-run king "because he is the living embodiment of the American spirit. ... Baseball is forever our national pastime because of people like Henry Aaron." The Braves wore their 1970s era white-and-blue uniforms, complete with small "a'' caps, in tribute to Aaron. The Braves are wearing an Aaron 40th anniversary patch on their uniform sleeves this season. The Braves unveiled Aaron jerseys from other college and professional teams in the Atlanta area. Falcons owner Arthur Blank, former Georgia coach and athletic director Vince Dooley and former Georgia Tech coach Bill Curry were among those who stood with their teams' jerseys adorned with Aaron's name and No. 44.